Recently there has been a lot of talk about wolves and photography. 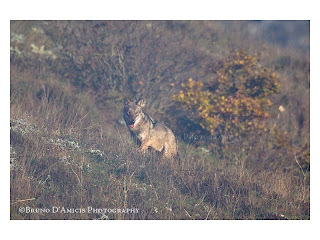 Who did not follow the events connected to the winning image at the Veolia Wildlife Photographer of the Year Competition 2009 (a spectacular shot of an Iberian wolf jumping over a fence)? I was very (and positively) impressed by the great interest the public opinion paid to the inquiry of the judges of the competition to verify whether the overall winner picture was depicting a wild wolf or just a captive one, as reported by some Spanish photographers. Everybody knows now the verdict. The photographer has been disqualified and his title withdrawn: the subject, a wolf named Ossian, lives in an enclosure in a wildlife center near Madrid and had probably been trained to jump in such “unwolfish” way. The photographer had declared that his secret was to have lured a wild wolf to go to a certain spot by means of repetitive baiting. Apparently, the fact that the circumstances in which the picture was taken had already been so severely manipulated was not of pivotal importance for the Competition board as the real nature of the subject. 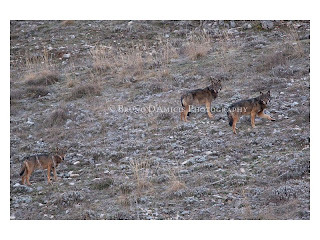 Months ago, groundbreaking pictures of "wild" European wolves (i.e. close-ups of pups at a den site and a stunning shot of a pack hunting a wild boar) appeared also on the blog of the project “Wild Wonders of Europe” (WWE). The images, taken by the Russian photographer Sergey Gorshkov after fourteen months of work in the field, then have been also published in a large portfolio on the pages of the prestigious British magazine BBC Wildlife. It seemed… The bar of wolf photography was set inexorably higher. This, at least, until the comment of a Russian reader of the WWE’s blog raised the question that also those wolves could be the same living in a local rehabilitation center, where herself had previously taken surprisingly similar shots. As this fired a lively discussion, the project’s organizers committed themselves to verify the circumstances behind those pictures. In reply to it, the photographer told about the many hours he spent in the hide, how he tried to make two wolves packs accustomed to people (“as in Finland”) and how he did rely on hunters’ help to locate a den with pups, whereas the animals were “cunning and cautious” and constantly changed den site. I will skip for now discussing further such practices of habituation and stalking, which I personally find ethically unacceptable and seriously dangerous for this species, especially in a country like Russia, where it is far from being protected. A first official response came from the organizers: they declared that some of the wolves in the pictures had been released from a rehabilitation center, so de facto “wild”, even though still accustomed to people. For all the other images, they guaranteed the photographer’s good faith. Nevertheless, this didn’t satisfy some keen readers, who confronted the single pictures with what had been declared by the photographer and found some inconsistency both on technical and ethological level. The debate kept on and was eventually solved few days ago with the official exclusion of the photographer and his images from the project. 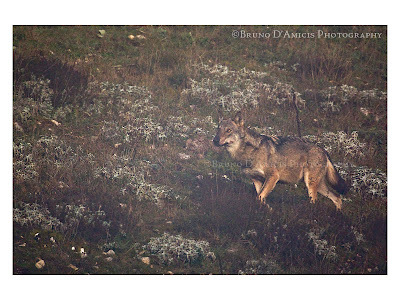 I also have a photography-related wolf story. Like many people, I also nurture a deep passion for this species and for everything it represents. Despite living in a wolf-rich country, the Abruzzi region in Italy, I must treasure the rare occasions, when I could observe or photograph this animal in its habitat. Recently I was assigned by a magazine to work on a story centered on the ongoing conflict between men and wolves in Abruzzi and the ways for a possible coexistence. 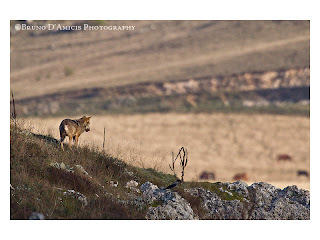 For the article to be complete, I needed a nice picture of a wolf in the typically barren Apennine landscape. I knew it would have been difficult, but I had some sort of plan and enough time. Since I do this job mostly because I like to spend time in nature and observe wildlife, I would have kept myself off from captive animals or controlled situations. It took me almost four months of research, phone calls, walks and hours of wait to obtain some satisfying pictures. 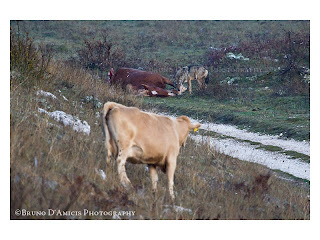 On a nice November day, I stumbled upon a solitary wolf male feeding on a horse carcass. Barely hidden by a small bush and a veil of fog, I took dozens of pictures of the feeding animal, even when some cows passed next to him. Unbelievable. At a certain point, for some divinity’s benevolence, the wolf left the carcass and trotted straight into my direction. Then, perhaps aware of my presence, he stopped some 50 meters from where I was sitting and, more curious than scared, gave me a brief glance. I will never forget the moment his eyes met mine. Eventually, as true ghosts do, he disappeared into the thickening fog and the magic was complete. The thrill of such a perfect wilderness moment vanished a bit after showing my pictures to the disappointed editors. My idea of a wolf clearly didn’t match theirs. They didn’t look into the wolf’s eyes, but rightly lingered on the dull colors of the pictures, the dry grass in the background, the pixel noise of the digital files. The late American wildlife biologist Adolph Murie wrote: "One does not need to see a wolf to benefit from its presence", but, in the age of animals which jump and kill their prey right in front of the photographers, is the hazelnut-colored look of a wild wolf still enough to persuade an audience? "My idea of a wolf clearly didn’t match theirs." well written. Perhaps this is why the captive animal that won the wildlife photograph of the year didn't ring any alarm bells? Give me a ruffled wild wolf anytime over a perfect captive 'calendar' wolf.